We picked the last of the Florida Prince peaches last weekend. 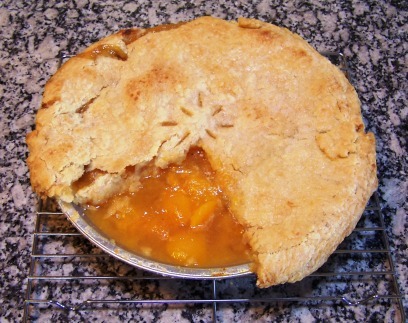 These early peaches aren’t quite as sweet as the summer ones, but still have a nice peach flavor that makes a good pie, which is exactly what we did with them. The tree bears extremely heavily each year and needs thinning right when I’m in the thick of grafting, so I never get around to it and we end up with a bunch of golf-ball sized peaches. It’s a bit weird to bite into a peach before the cherries are ripe, but we take it when we get it here. We’ve been picking blueberries for about a month now, and Dorsett Golden looks to be a week or two off the kick off the apple season. 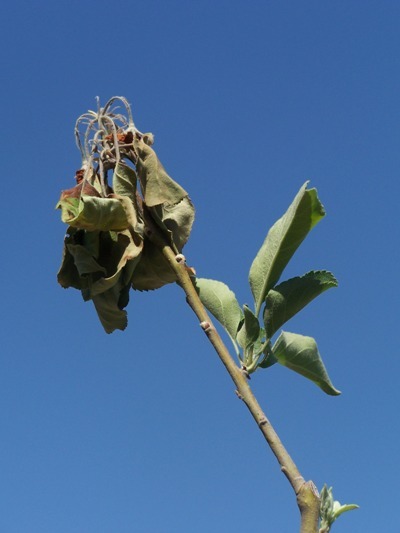 Our unusually cool and wet spring has allowed fire blight to rear its ugly head. In a normal year we would have had a stint of 100+ degree weather that would have knocked this bacterial disease out for the year, but the highest we’ve had is in the mid-80’s, perfect weather for this disease. I caught it early and so far have been able to relegate it to just branch tips and clusters, but I’ve had to prune off a lot of clusters. Three years ago I didn’t know what it was before it got well into the trunk of my Gala tree, notorious for being a fire blight magnet. I use a mini butane torch to sterilize my clippers, which is faster than the spray bottle of alcohol. No heat in sight yet, so I’ll have to keep making the rounds. The ornamental pear street trees and Redbud trees are getting hammered. Nothing on my pears yet, but its only a matter of time. Spent the day at Disneyland today, and Tomorrow Land is landscaped with edibles. The planters have lettuce, kale, strawberries, and all kinds of herbs; bushes consist of natal plums, citrus, guava. The trees are fruit trees including citrus, avocado, apricots, plums, figs, macadamia, and yes, APPLES!!! They were just starting to blossom and so I suspect they are Fuji, and despite being severly pruned to keep their shape they will still probably bear a bunch of apples. 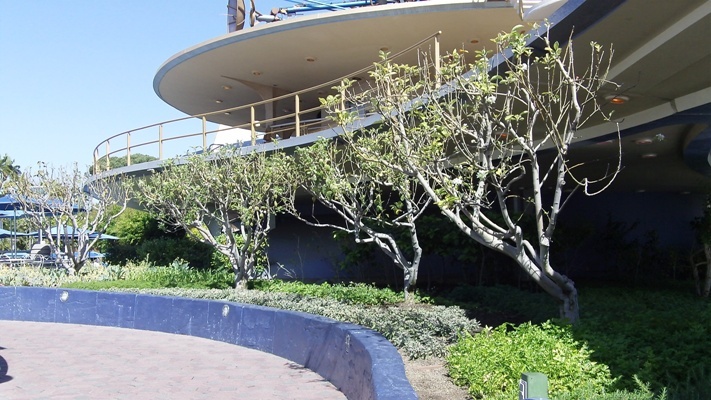 Kind of a nice switch from the usual ficus trees you see there.